Twelve people were killed today when gunmen who claimed to be Al Qaeda terrorists carried out a massacre at the offices of a notoriously anti-Islamist newspaper in Paris, including a police officer who was executed as he begged for mercy on the pavement. Three masked attackers were carrying Kalashnikovs burst into the Charlie Hebdo headquarters, opening fire on staff after seeking out journalists by name. 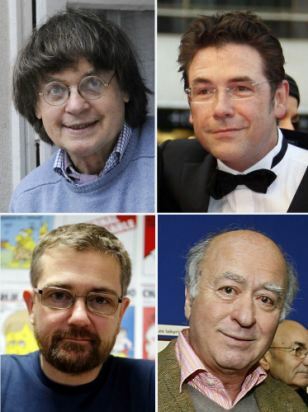 Four of France’s most revered cartoonists – Stephane Charbonnier, Georges Wolinski, Bernard ‘Tignous’ Verlhac and Jean Cabut – were among 12 executed by gunmen. Those executed included four of the most famous cartoonists in France, men who had regularly satirised Islam and the Prophet Mohammed, including the newspaper’s editor-in-chief, Stephane Charbonnier. Witnesses said the suspect Al Qaeda killers were heard to shout ‘the Prophet has been avenged’ and ‘Allahu akbar!’ as they stalked the building. Horrific footage also emerged showing an injured police officer slumped on the pavement outside the office as two of the gunmen approach. In an apparent desperate plea for his life, the officer is seen slowly raising his hand towards one of the attackers, who responds by callously shooting him in the head at point-blank range. Despite a shoot-out with armed officers, the ‘calm and highly disciplined’ men who reportedly spoke perfect French were able to escape in a hijacked car and remain on the loose.